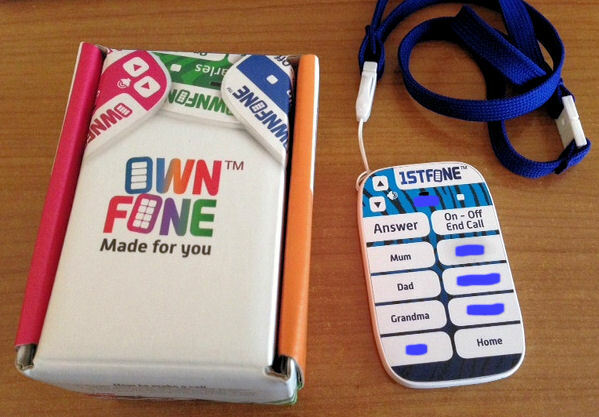 Review: Who needs a phone for little ones? or for disability? We do…. If I listened to all the hype I’ve heard over the years, I could be forgiven for thinking that mobile phones were the root of all evil and parents giving a mobile phone to a child under the age of 13 should be shot as bad parents of the year. I have never understood how children aged 4 + often go to friends, parks at the end of the road, walk to shops or more, all alone, and all phone free. Fast forward to age 13, when teens get a mobile to mix with the real world – these same kids suddenly have to make themselves available at every beck and call on the end of a dring dring. I really don’t understand how people can cope with their under 13’s ruling the roads and having no idea where they are, with no way of getting help if things go wrong, yet when they magically turn the age of their parental consent, they have to check in at every available opportunity. Perhaps it’s having special needs children that makes me more worried about how they will cope if they get lost. I’m not entirely sure, but I do know I’m all in favour of phones from early ages. The opportunity came along to trial a new phone for little ones and while two of my children are well above the age for basic phones, I have one special needs child who can’t cope with a regular phone and who really really wanted one. I was a little worried as he can’t read at all yet and I wasn’t sure quite how well he’d cope with it. We’ve had our phone for a couple of weeks now and he’s mastered which buttons to use for what so if he gets himself into a pickle, we can phone him and he can just work through his 8 numbers until he gets to someone who can help him. We usually struggle with Vodafone in our area as the signal isn’t great and often non existent on smartphones, but this is managing to pick up a signal no problem around here. It’s a dinky wee thing and just the size of his hand and very easy to use. I think it’s the perfect phone for little ones, and it comes with a lanyard so they can hang it around their necks and tuck it into t-shirts, blouses or jumpers to keep it out of the way. I do think it’s a great solution for the many special needs and disabled children who can’t manage a regular phone, and 1stFone are coming out with picture buttons soon where we can simply have pictures of the people they can phone instead of the texts. The important thing for it is that they can only dial the numbers of the people who have been programmed on the phone and it can’t text or get onto the Internet. I feel happier knowing that he can’t dial random strangers with it and it really is a peace of mind thing. 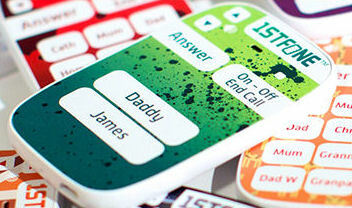 Kids can tailor the phone to suit themselves with colours, and designs on the website, so they can have theirs personalised and with their own names on it. I’ve had to blot out the names of my lads carers as they can’t go online, but you can see how ours was designed in the photo. A few people who have seen his phone have been fascinated and shown a lot of interest. We’ve already decided that ours will stay hooked up in the Scottish Mum household after out trial period is up. There is no way he is going to let us do away with his own phone now. His carers are getting used to phone calls coming through to them. They don’t mind at all and he’s delighted that he can phone me, his dad and his grandma just like his brothers can. If his carers change, all I need to do is phone 1stfone and they’ll reprogramme those slots for me and send out new cover labels. It’s fab. I have to say a huge thank you to 1stFone for letting us trial this, as it’s absolutely brilliant. I couldn’t imagine how I was ever going to be able to get him a phone as he can’t read, but this does it beautifully. I’d have no hesitation in giving this to a young child or special needs youngsters out and about as a just in case. Great post! It makes perfect sense for your son. My son is loving having his own phone, but it’s not quite so essential for him. I would have got these for my other two when they were younger if they’d been around then. Fabulous things.. It is absolutely brilliant. My boy has just figured out which button phones who by phoning them. The pictures will be even easier. I wish I’d had these years ago.